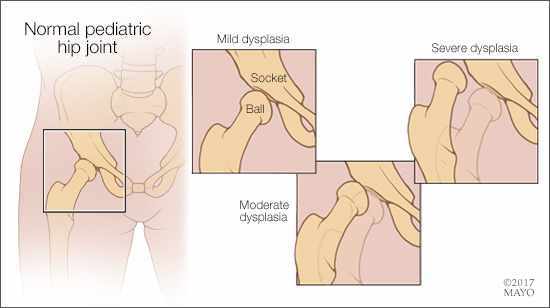 Mayo Clinic Q and A: Hip dysplasia — when is surgery required? DEAR MAYO CLINIC: What causes hip dysplasia in adults, and can it be treated without a total hip replacement? ANSWER: Hip dysplasia is a condition in which the top portion of the thigh bone doesn't fit properly in the socket portion of the hip joint — either because it is out of place or it is not the correct shape. In many cases, this condition is present at birth. Some people may not be diagnosed during childhood, however, and only when symptoms appear later is the problem identified. Although some adults with hip dysplasia need surgery to correct the problem, total hip replacement isn’t always necessary. The hip is a large ball-and-socket joint. The ball portion of the joint is the top of the thigh bone. It’s called the femoral head. 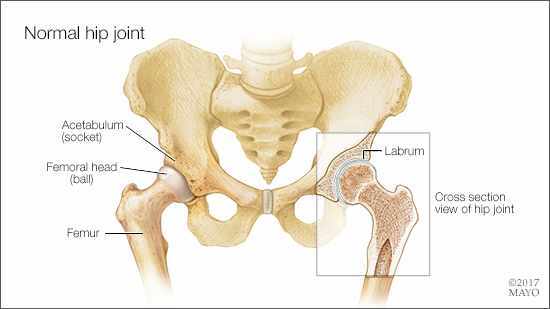 It fits into the socket portion of the joint, called the acetabulum, which is part of the pelvis. Between the two is a layer of smooth cartilage that allows the joint to glide easily when it moves. Ligaments, tendons and muscle stabilize the hip joint and keep it in place. Before birth, the ball and socket of the hip must fit together properly, because they act as molds for each other during fetal development. If the ball isn't seated firmly into the socket, the socket will not form fully around the ball, and the socket will be too shallow. In some cases, during the final month of pregnancy, the space within the womb can become so crowded that the ball of the hip joint moves out of its correct position, which results in a shallow socket. This happens more frequently in large babies and those in the breech position before birth. Hip dysplasia also can make the joint more likely to develop osteoarthritis. Osteoarthritis wears away the cartilage on both the ball and the socket, leading to joint pain, stiffness and a loss of flexibility. When hip dysplasia is diagnosed in adults, surgery may be required to prevent further damage to the hip joint. If an adequate amount of cartilage still exists between the ball and socket, realignment surgery on the existing joint often is recommended to fix the problem. This usually involves reshaping or repositioning the hip socket, so the femoral head fits into it better, providing more stability and decreasing wear and tear on the joint.